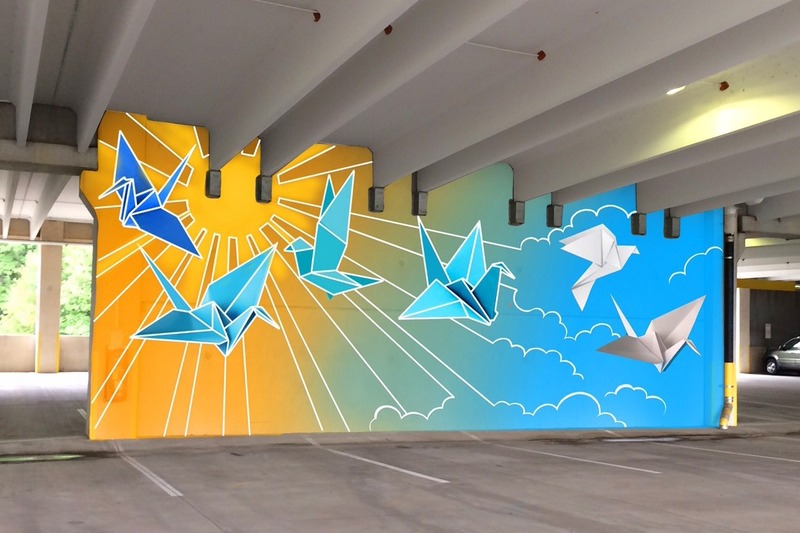 The dedicated muralist of Asheville will come together on August 25th and 26th this year and donate their time to beautifying the entrance to the Cancer center. We will involve the community and all are welcome! We will be making muralists out of doctors, patients, visitors, and anyone who feels the mood strike. Our theme is hope, and we hope you will be able to help our plan become a reality. Please donate to help us reach our target. We are trying to cover an entire floor of the parking garage in beautiful inspiring work and we need this help for our materials. The weekend of this event will be an excellent painting party with food, music, family and all the coolest mural stars of Asheville ! Donate what you can , Share far and wide, and come grab a brush and show us what you've got!!! Hello everyone!We have just been blown away by the tremendous generosity of all of our wonderful donors so far. We are doing good, about halfway to our target currently. The glass is indeed half full! Please continue to share this project around, perhaps mentioning it to that wealthy uncle bobby would be a good idea. We feel so warm in the heart at all that we have raised so far in such a short time frame, and there's not very much time left but with your continued support we have a very good likelihood of hitting our target. We are starting to hear back from the very big hearted muralists of Asheville, agreeing to bring the love and work for this project! now we need you guys to help us out by donating and sharing!!! Such an excellent start for this very worthy cause! thank you to all the amazing and generous donors so far that are helping make this sweet dream come true. and a very warm thank you to all who have spread the word by sharing this. Let's keep the momentum going so we can reach our target! Any size donation is very much appreciated. And as always sharing this story goes a very long way to helping us be successful!